Purchase Management is an activity for sourcing goods & services from various suppliers. With the help of this module, you can perform purchase management function within your store. Add various suppliers to a product, create purchase orders, manage quotations, incoming shipments. When the product goes out of stock, it automatically creates a purchase order. 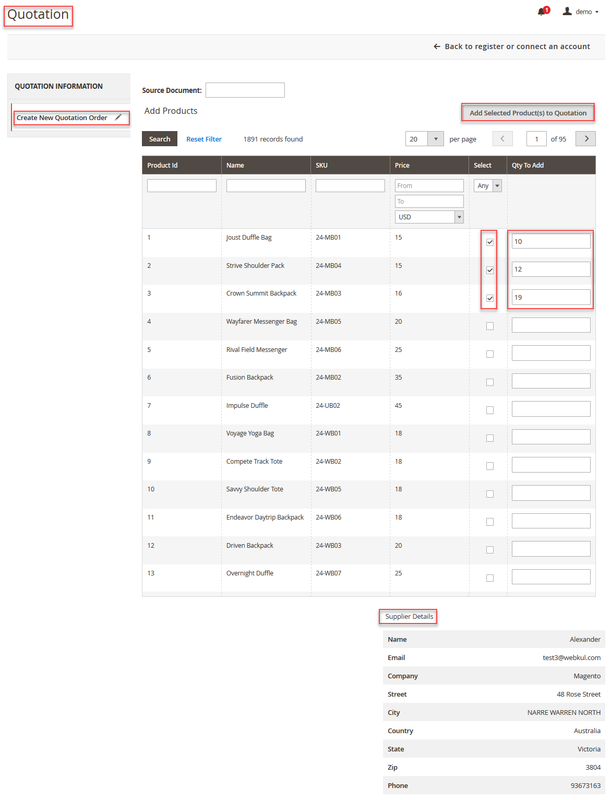 Set the procurement method – auto or manual. Default prefix for the purchase order number. Send quotation and purchase order emails to the suppliers. Add any comments to purchase order, incoming shipment and notify the suppliers. Add suppliers in a product by specifying – cost price, quantity, priority. Manage incoming shipments and products from the suppliers. Update information about the partial shipments. Draft purchase order, when a product goes out of stock. A draft purchase order will be made for the supplier who offers the best price. The admin can create a new purchase order for any supplier. It supports multiple languages translations. The source code is open for customization. After extracting the downloaded zip file, you will get the src folder. Inside src folder, you will find the app folder, copy the app folder to the Magento2 root directory. Please view the below screenshot. After the successful installation, you have to run these commands in the Magento2 root directory. For Multilingual support, please navigate. Store>Configuration>General>Locale Options. And select your desired language from the Locale option. If you need to do the module translation, please navigate the following path in your system. app/code/Webkul/PurchaseManagement/i18n. Open the file named en_US.CSV for editing as shown in below screenshot. After editing and translating the CSV file, you need to save the translated file name according to your region language and country code such as – de_DE.CSV. Then upload the translated file to the same folder from where you have obtained it. Now your module translation is complete. To do the module configuration, please navigate through Webkul Purchase Management>Purchase Configuration. Also, the admin can go to Stores>Configuration>Webkul>Purchase Management. Procurement Method – Select how you want to procure the products and create purchase orders. 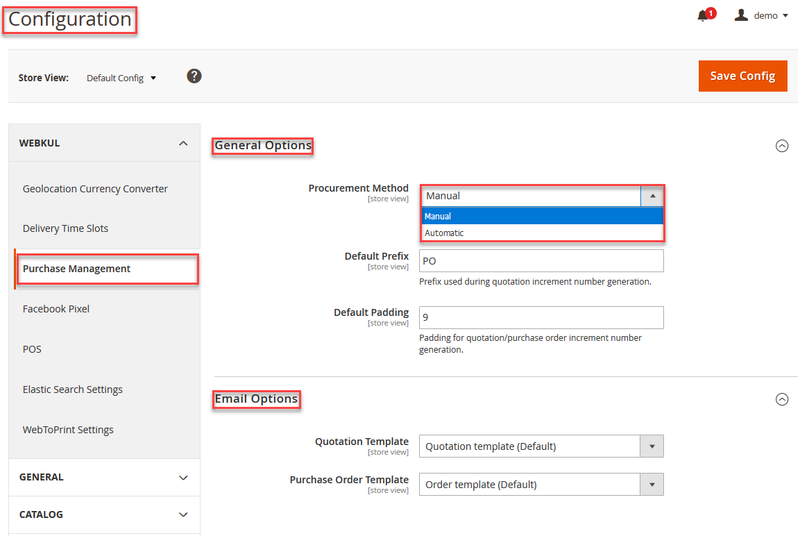 Manual – Select this option for creating a purchase order manually. 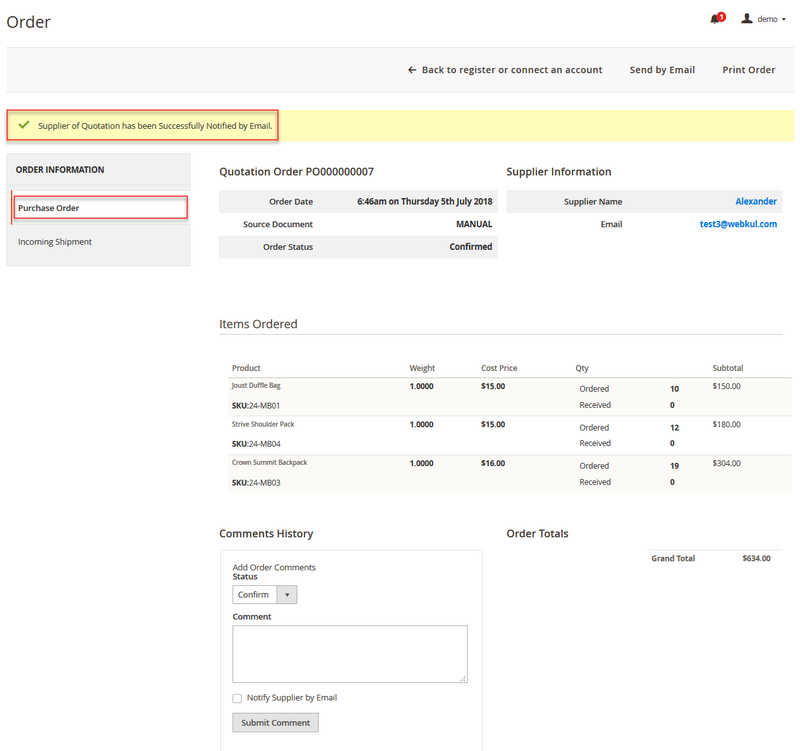 Automatic – Create an automatic purchase order, whenever the product goes out of stock. Default Prefix – Enter any prefix for the purchase order ID number. 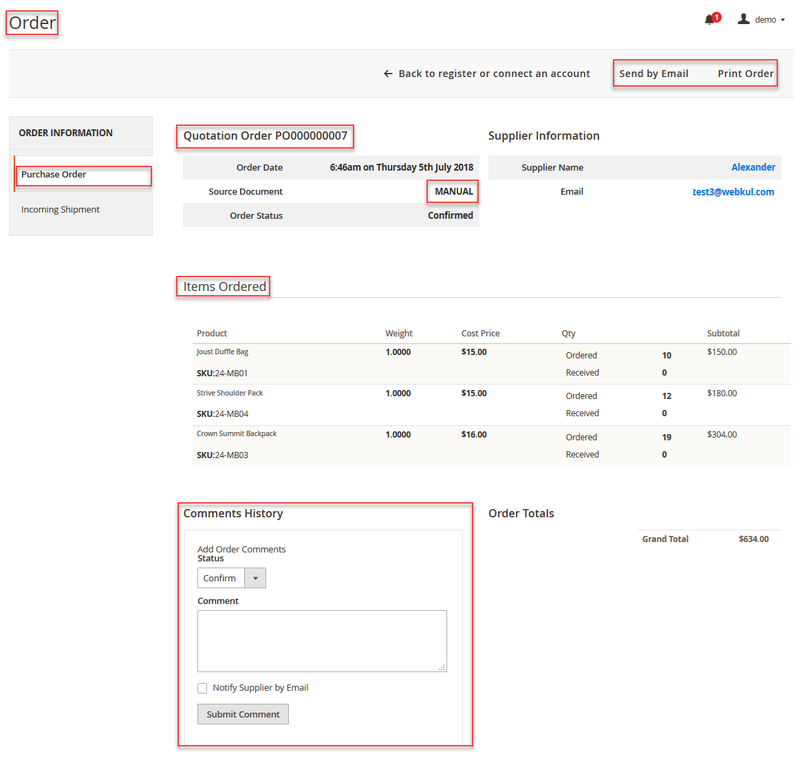 Default Padding – Enter the padding for the purchase order ID number. Quotation Template – Select the Quotation mail template that will be sent to the suppliers. Purchase Order Template – Select the Purchase Order Template that will be sent to the suppliers. Lastly, click Save Config to apply your changes. First, you need to add suppliers’ information in Magento. Please navigate through Webkul Purchase Management>Manage Suppliers>Add Supplier. Please enter all the required information about the supplier and then click Save Supplier. After creating the new supplier, it will appear on the supplier list. You can view the supplier name, email, company, telephone, zip, supplier since. Edit – Click Edit to update any supplier information. Actions – Use the option to Delete a supplier from the list. After creating the suppliers in the previous step, you need to add suppliers for each product. Navigate through Products>Catalog>Edit. Select any product and go to its settings. Cost Price – Enter the cost price of the product. This cost price will be used while creating a manual purchase order. Config Settings – Use this option to apply module configuration procurement method. Automatic – The draft quotation will be prepared when the stock goes out of stock. Manual – The purchase order will be prepared manually by the admin. Then, you will find the Supplier tab on the page. Here you need to provide the supplier information which will help in preparing the automatic draft purchase order. 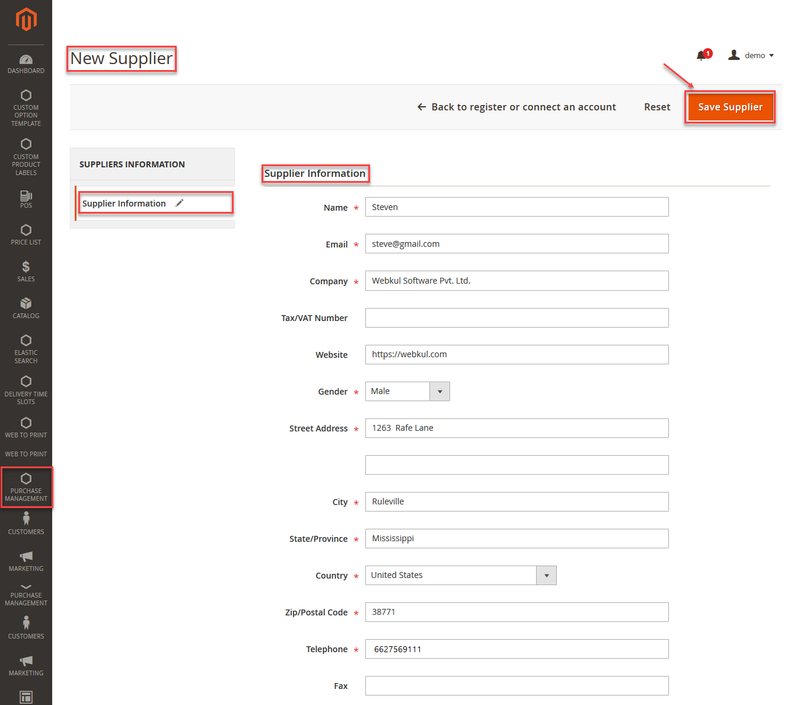 Add New Supplier – Click this to add a new supplier option for the product. Choose Supplier – Select the available supplier from the drop-down menu option. Minimal Quantity – Enter the minimum order quantity for the automatic purchase order. For eg. if 10 is entered here, then the draft purchase order will be of 10 order quantity. Lead Time (In Days) – Set the approximate lead time for the suppliers. Priority – Enter the priority of every supplier. While preparing the automatic draft purchase order, the supplier will be selected based on the priority set here. For eg. if there are two suppliers with priority 1 and 2, then automatic purchase order will be created for the supplier having first priority. Status – Set this as Enabled to use this supplier, else select Disabled. Add New Row – Click this to enter the Quantity and Cost Price details. Please make to add the minimal quantity cost price for making the auto-draft purchase order. Automatic Quotation Note: – If there are multiple suppliers available for a product. Then the supplier will be selected according to the priority. Also, if minimal quantity’s cost price is not set, then the cost price will be selected for the higher quantity. For managing the quotations please navigate through Webkul Purchase Management>Quotations. After clicking this option, following page will appear. 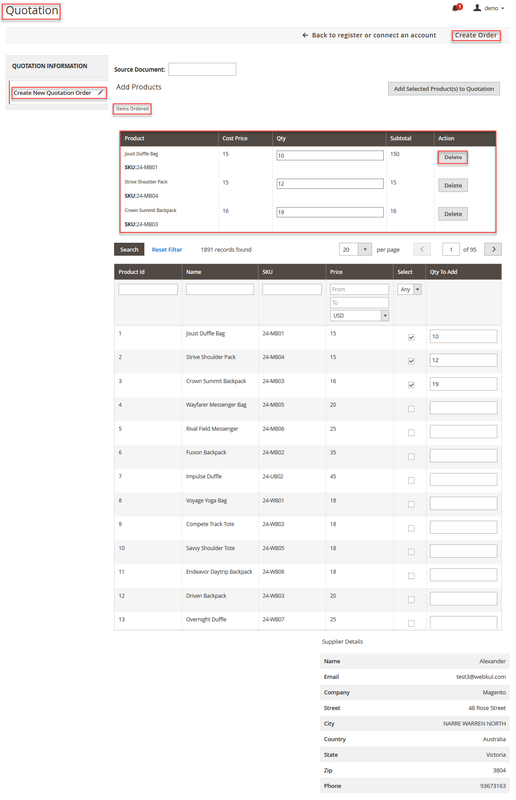 From here you can view the Purchase Order ID, Created Date, Source Document, Supplier Email, and Status. After the admin configures the suppliers in the product settings, the draft quotation will be prepared automatically when the product goes out of stock. The draft quotation will be prepared for the supplier according to the mentioned priority, minimal quanity and the cost price. 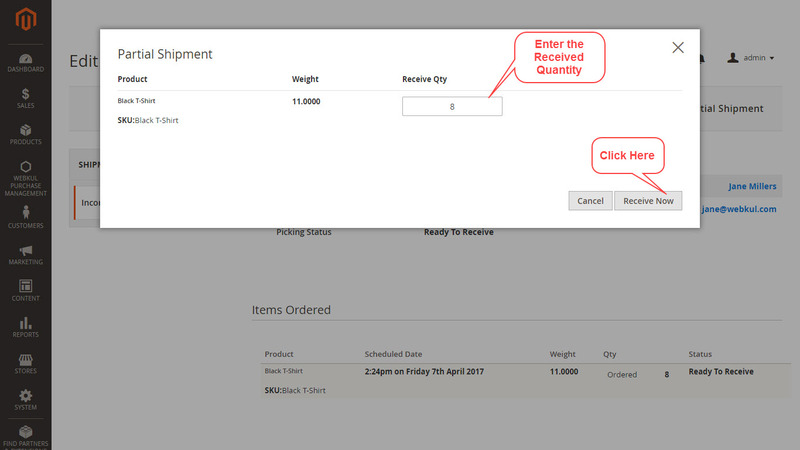 Create New Purchase Order – Click this button to generate a new purchase order for the supplier. Actions – Use this option to Cancel, Merge, Confirm, Email, Print, or Delete a Quotation from the list. View – Click this to view the detailed information about the purchase order. Filters – Use this option to search any quotation from the list. To create a new purchase order for a supplier, please navigate through Webkul Purchase Management>Quotations>Create New Purchase Order. Then, you need to select any one of the suppliers from the list. Here you can view the Supplier ID, Name, Email, Company, Telephone, and Zip. Source Document – Enter the name of the source of this purchase order. If the field is left empty, source name will become MANUAL. Simply click any supplier according to your preference and continue to the next step as follows. After selecting the supplier from the list, you need to add products in the purchase order. Click the Add Products button to view the products list. You can also view the selected supplier details on this page. Now, you can view the listing of all the products here. Select the products you want to order and the quantities. 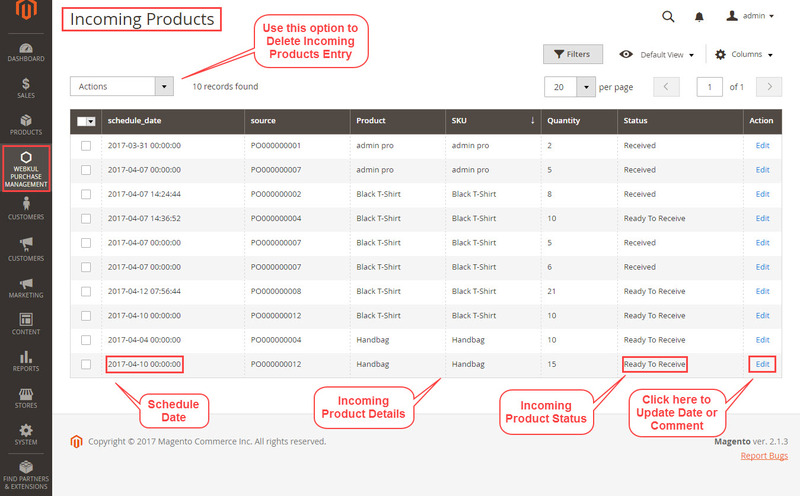 Then click Add Selected Product(s) to Quotation, after doing the selection of products. Your selected products will appear on top of the page. Click Delete if you want to remove a selected product. After checking the details – product, cost price, quantity, click Create Order. Now your Manual Purchase Order has been created successfully. You can view the new Purchase Order ID in the screenshot below. Use the Actions drop-down menu to Cancel, Merge, Confirm, Email, Print, or Delete the quotations. Simply click View to see the detailed information about the selected quotation. After clicking the View link, following page will appear. Here you can see the quotation information. Items Ordered – You can view the summary of items ordered – product name, cost price, quantity, weight, SKU. You can update or delete the product items of the quotation. Edit – To update the purchase order click Edit. Send by Email – Click this, to send this purchase order to the supplier by an email. Confirm Quotation – If all the information is correct, click Confirm Quotation. Now this quotation will be changed to a purchase order. Comments – You can also add any comments with this quotation. After confirming the quotation, a success notification will appear. 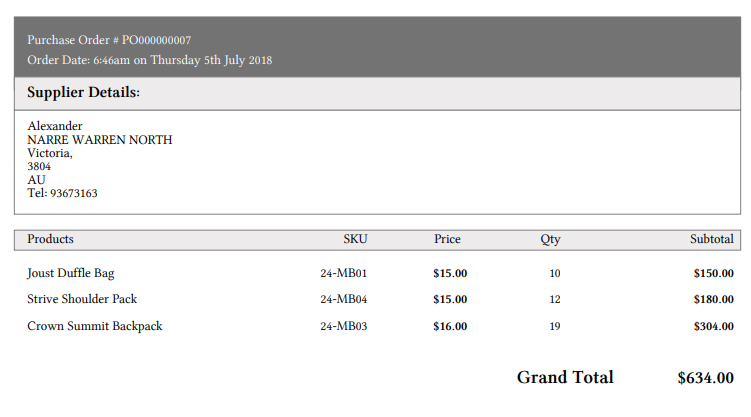 You can add comments, send email, and print this order. If you click the Send by Email, the success notification will appear on the page. The quotation information will be appearing in the supplier’s email. Once the draft quotation is prepared, you can send the quotation to a supplier for confirmation. Here’s the sample email of a request for quotation which will be sent to the supplier. 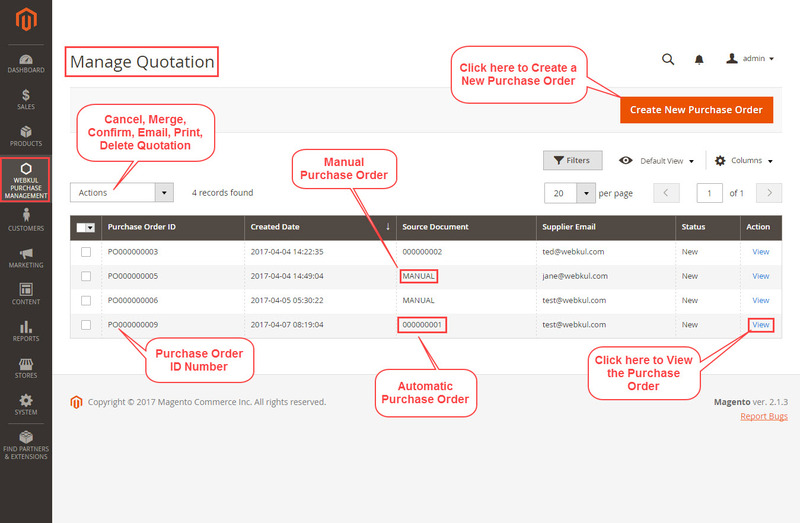 To view and manage all the purchase orders, navigate through Webkul Purchase Management>Purchase Order. Here you can view all the purchase orders created – both Automatic & Manual. 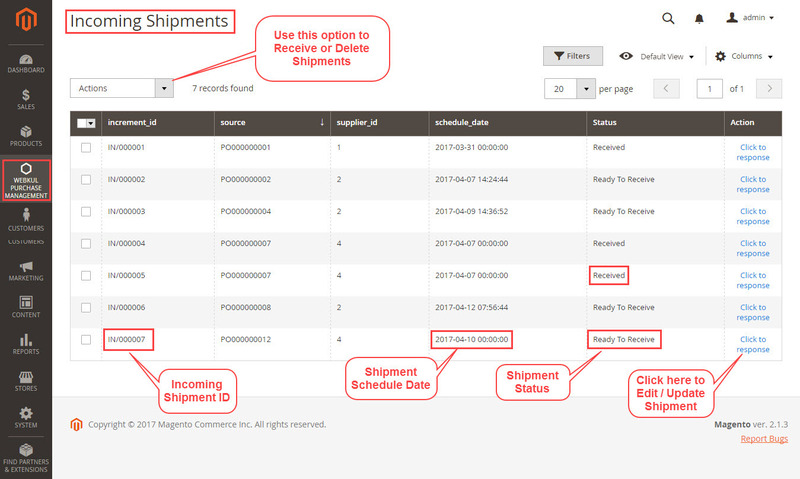 You can see the Purchase Order ID, Created Date, Source Document, Supplier Email, Status. 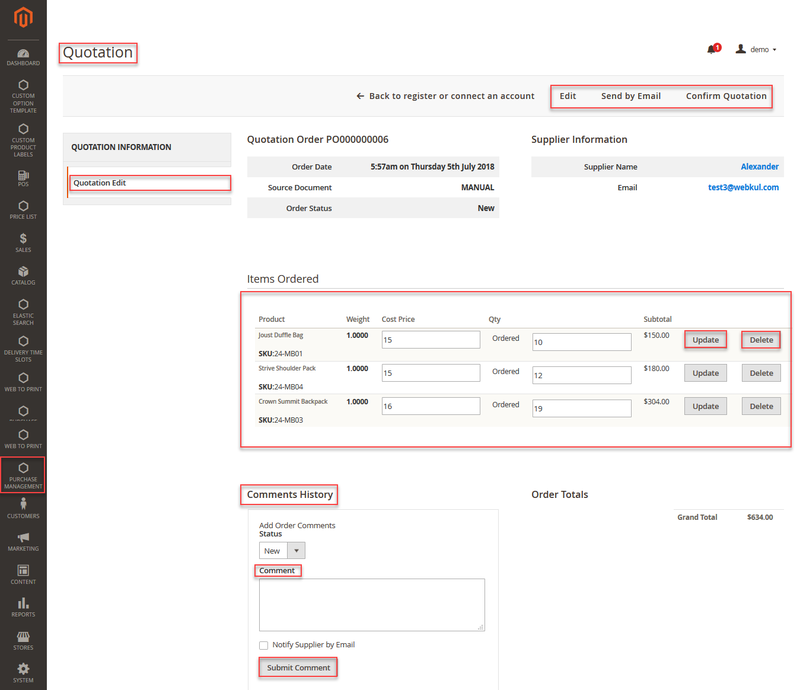 Once the quotation status changes to Confirm, it will be visible in the Purchase Order menu. 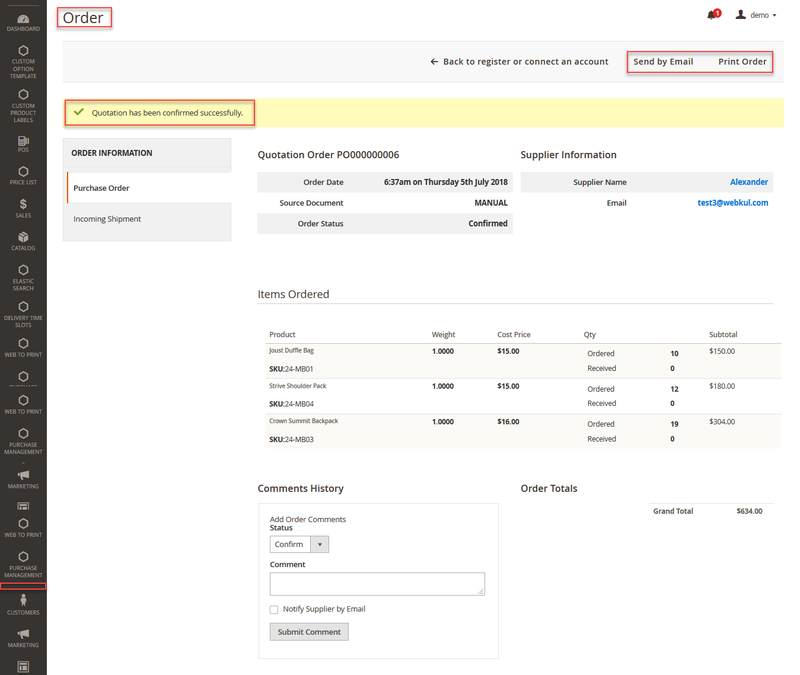 Actions – Use this option, to Print or Cancel any purchase order from the list. After clicking the View link, the admin will see the following page. 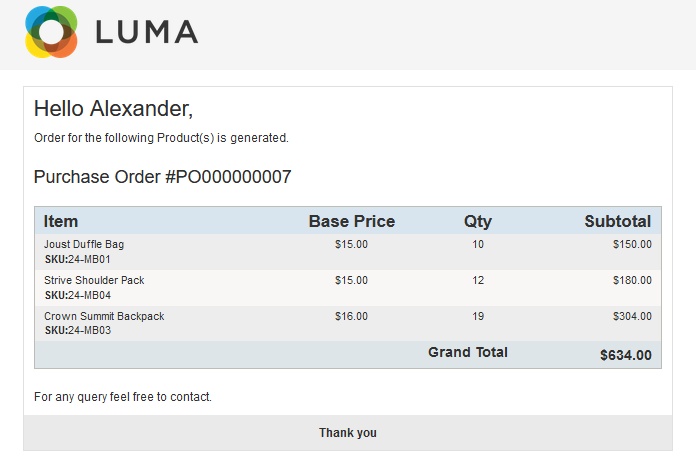 Here, the admin can view the complete Purchase Order Information. The admin will see the Quotation Order Number, Supplier Information, Order Date, Order Status, Source Document. 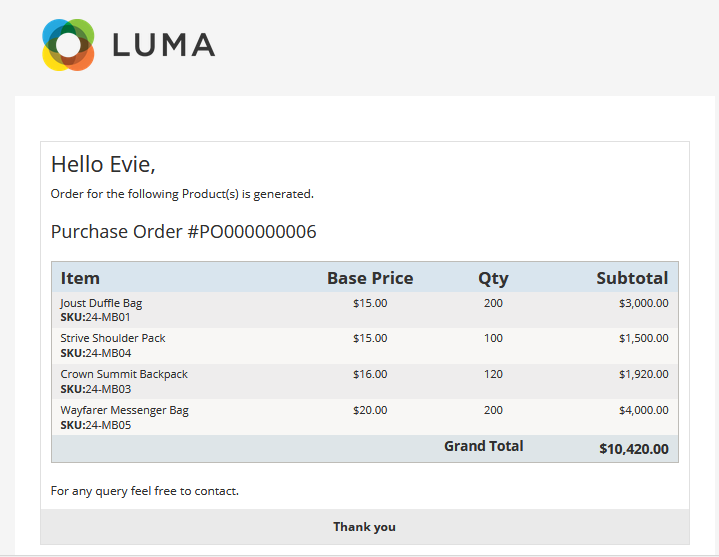 It will show the Items Ordered Information- Product name, Weight, Cost Price, Quantity, and Sub-total. Add any comments in this Purchase Order. Send by Email – After clicking this button, the purchase order will be sent to the supplier’s email address. Print Order – To print the Purchase Order information, click Print Order. Here’s the sample Purchase Order Print. In the printout, it will have the Purchase Order#, Order Date, Supplier Details. Items ordered mentioning the product name, sku, price, quantity, and subtotal. After sending the purchase order to the supplier, an incoming shipment will be created. To view and manage Incoming Shipments navigate through Webkul Purchase Management>Incoming Shipments. From here you can view the Increment ID, Source, Supplier ID, Schedule Date, and Status. 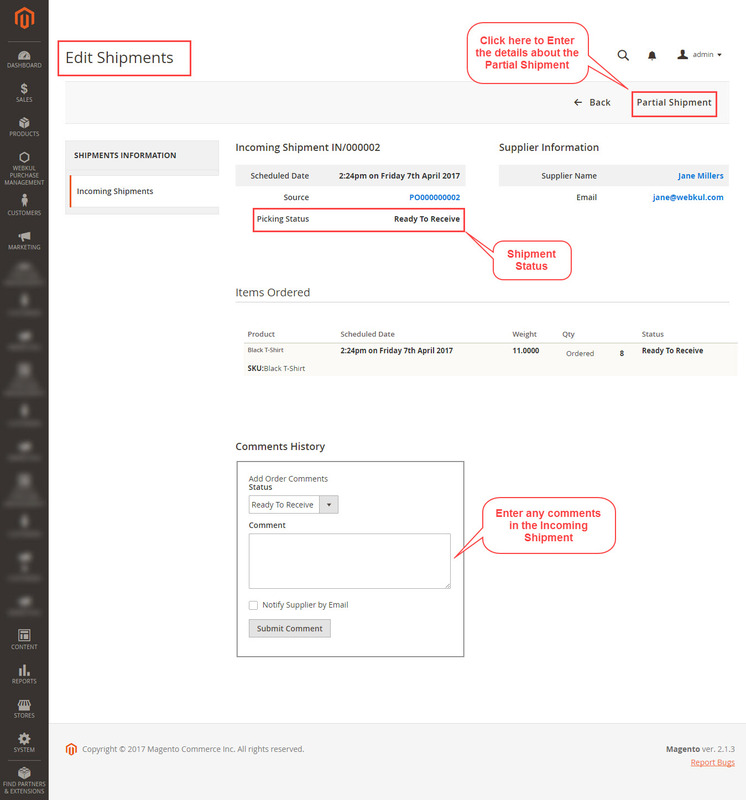 Actions – Use this option to Receive or Delete incoming shipments. Click to Response – To Edit or Update an incoming shipment, click this option. From here you can view the detailed information about the incoming shipment. View items ordered, picking status, supplier information, add any comments. Partial Shipment – If a supplier delivers an order into two or more parts, you can update the information here. Add Comments – You can add any comments with this incoming shipment, and notify the supplier. After clicking the Partial Shipment, a small window will appear. Enter the quantity of product received and click Receive Now. This information about the products received will be now be updated. You can view all the incoming products information at one place. 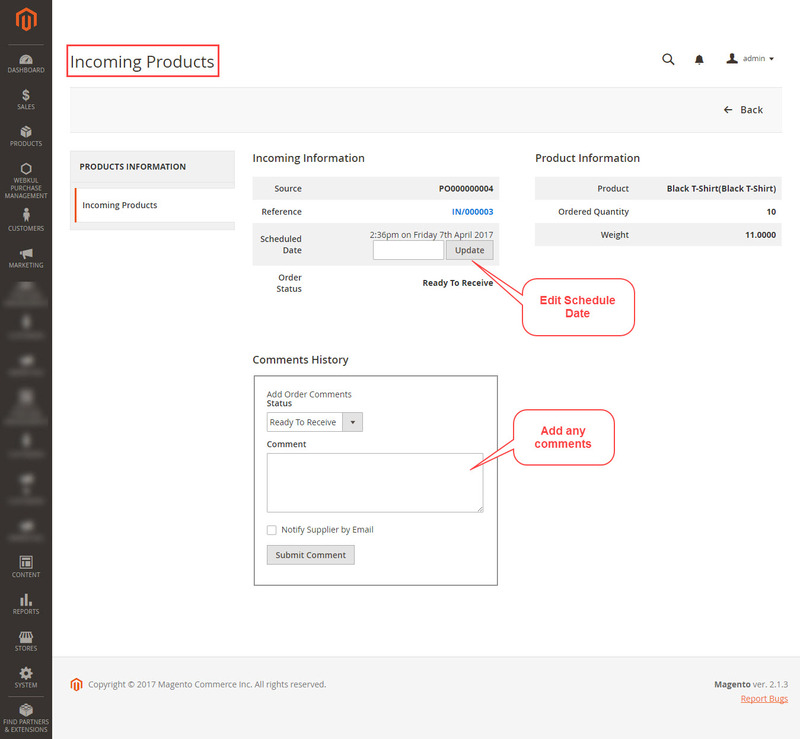 Navigate through Webkul Purchase Management>Incoming Products. From here you can view the Schedule Date, Source, Product Name, SKU, Quantity, Status. Click Edit to update the scheduled date or add any comments in for an incoming product. After clicking Edit, following page will appear. From here you can view the information about the incoming product. You can also update the Scheduled Date of the incoming product. Add any comments to this incoming product and notify the supplier. After sending the purchase order to the supplier, What is the way to pay the supplier?